There are several related plants referred to as "Reiblumm" ("border flower") in Deitsch. 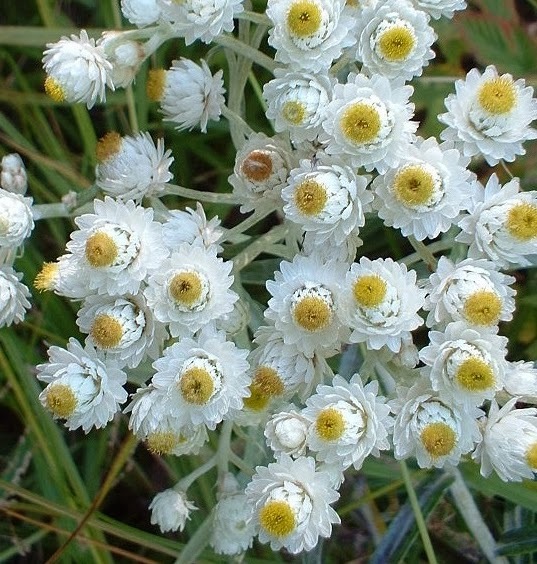 One is the commonly used Gnaphalium polycephalum, which is known as Cotton Weed or Life Everlasting in English), and another is Anaphalis margaritacea, which is known in English as Western Pearly Everlasting, Pearly Everlasting, or simply as Everlasting. This particular species is the only North American species in the Anaphalis family. It is also native to Asia and widely introduced in Europe. The name Reiblumm refers to the plant's propensity to grow in grassy areas alongside fields. The alternate name, "Reinblumm" is often translated as "pure flower," but, in all likelihood, is actually a holdover from other German dialects and also means "border flower." The third Deitsch name, "Ruhrgraut," means "diarrhea herb" because infusions of the plants leaves and flowers were consumed to combat dysentery. This is a use still found today in some parts of the Deitscherei. Another use is reflected in the last Deitsch name of the plant, Satzblumm. The leaves of the plant were at one time used to make yeast (Satz), and the relationship of the plant to yeast still brings about uses to counter excess elemental Light in Braucherei in the Urglaawe context. Light imbalances cause afflictions that manifest themselves mostly in nervous conditions, including tics, and in various bodily functions working in "overdrive" (hence dysentery). Interestingly, according to David Lick (193), an old custom survived in Montgomery County, PA, at least into the time they wrote (1922). The plant was collected and children who suffered from asthma slept upon it. Lick, David E. Plant Names and Plant Lore among he Pennsylvania Germans. Proceedings of the Pennsylvania German Society 33. Norristown, PA, 1922.